Have you ever read a book that you liked, but that at the same time made you want to shout, "Stop! Stop being so annoying, damn it!"? 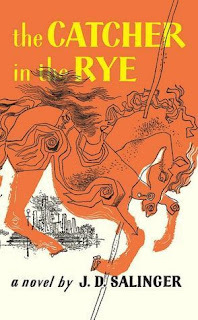 Well, that was Catcher in the Rye for me. In the beginning of the book, Holden’s voice brought humor, but by the middle of it, I was already screaming – well, not out loud – "Grow up, you annoying little pest!" Every time he overestimated his younger brothers, I wanted to throw the book at the wall (I know, I’m a bad reader). On the other hand, I could understand Holden’s desire to remain a child. I think anyone could relate to that wish to remain innocent and naïve. I also liked Holden’s sister, Phoebe, and the way she criticized him and pushed him to do better. Phoebe seemed to be the only person throughout the book that Holden really loved. His love for his little sister is shown when he wants to run away and refuses to take her with him, deciding to go home with her. Although Phoebe is six years younger than her brother, she seems the mature one and she becomes Holden’s guide towards adulthood. I liked Phoebe better than Holden, but that might be just my dislike for whiny brats kicking in. Among other things, you'll find that you're not the first person who was ever confused and frightened and even sickened by human behavior. You're by no means alone on that score, you'll be excited and stimulated to know. Many, many men have been just as troubled morally and spiritually as you are right now. Happily, some of them kept records of their troubles. You'll learn from them — if you want to. Just as someday, if you have something to offer, someone will learn something from you. It's a beautiful reciprocal arrangement. And it isn't education. It's history. It's poetry. That was the most important message I took from the book and the thing that put Holden's problems into perspective. And for all that the main character was annoying, I'm glad I read this book. Yes! I know what you mean. I haven't read this book in a long time but I remember Holden being annoying. He was :) Thanks for commenting! I read this when I was about 14. I loved it then but can't remember why. It's on my shelf to reread again. My 15 yr old stepson is reading this for school at the moment...and hating every minute of it!